During the 1730's the Trustees of the Georgia Colony, aided by funds from the Worshipful Society Of Apothecaries of London sought to grow new world medical plants both for their therapeutic value and for the enrichment of empire. The Society's participation is recognized as the first activity of organized pharmacy in America. Erected 1983 by The American Institute of the History of Pharmacy and the Georgia Pharmaceutical Association. Location. 32° 4.71′ N, 81° 5.054′ W. Marker is in Savannah, Georgia, in Chatham County. 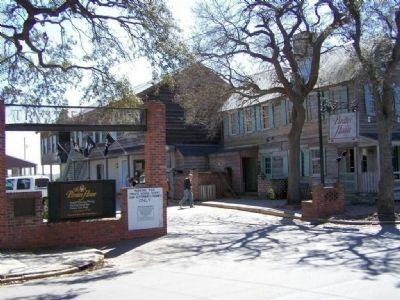 Marker is on East Broad Street near East Bay Street, on the left when traveling south. Touch for map. Marker is half block from East Bay Street, at the Parking lot for today's Pirate House, located on the sidewalk side, in the brick wall. Marker is at or near this postal address: 20 East Broad Street, Savannah GA 31401, United States of America. Touch for directions. 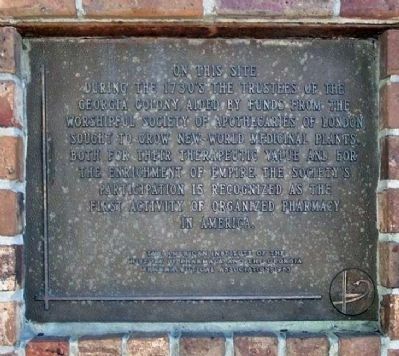 (about 300 feet away, measured in a direct line); Old Harbor Light (about 300 feet away); Washington Fire Company (about 400 feet away); a different marker also named The Georgia Medical Society (about 400 feet away); John B. Hohenstein, Sr. (about 500 feet away); Rev’d A. Dale Umbreit (about 500 feet away). Touch for a list and map of all markers in Savannah. More. Search the internet for New World Medical Plants. Credits. This page was last revised on June 16, 2016. This page originally submitted on March 14, 2008, by Mike Stroud of Bluffton, South Carolina. This page has been viewed 1,513 times since then and 2 times this year. Photos: 1. submitted on August 28, 2013, by Mike Stroud of Bluffton, South Carolina. 2. submitted on March 14, 2008, by Mike Stroud of Bluffton, South Carolina. • Christopher Busta-Peck was the editor who published this page.